Not all dog collars and leashes are created equal. Buckaroo Leather's quality leather dog leashes and collars are not only unique and stylish but will be the only collar and leash you have to buy. Let's talk history. Dog collars have been around since Ancient Egypt. Dogs in Ancient Egypt were considered hunters or protectors not pets. The Egyptians used dog collars in all their dog training. The dog collars became quite artistic. In ancient Greece dog collars were used more to protect the dogs. Farm dogs wore spike studded collars and sheepdogs wore a leather collar studded with nails. These studs protected both dogs from being bitten in the neck by a wolf. An interesting fact is that sheepdogs needed to be white, so they could be seen at night. While the farm dogs had to be black, so they could be concealed to surprise intruders. In the Middle Ages, dogs were used as hunters and shepherds. Their dog collars used were made from simple leather for boar and hare hunting. In Europe, during the Renaissance, owners used plain dog collars, but added rings for leashes and name tags. Leather Dog collars and leashes have come a long way.......through history. The functions of the dog collar and leash are the same today as in ancient times. You can choose from all kinds of styles of dog leashes and collars but to find the same durable craftsmanship as in ancient times look no further than Buckaroo Leather. Buckaroo Leather has quality leather dog collars and leashes. Our dog collars and leashes are all hand bench made in our shop in California. Both dog collar and leash are made from Hermann Oak heavy weight supple rein Leather. Buckaroo Leather also has quality custom leather dog collars and leashes with your choice of conchas to suit your style (or your dogs!). Our western dog leashes and collars are crafted from the finest Hermann Oak Leather. It is a supple heavy weight leather. The dog collars and leashes and the leather used are all American Made!!!! Pioneer Women of the 1800's...Strong, Courageous, smart. Women on the frontier in the 1800's were not the beautiful dainty wallflowers like their counter parts in Europe. The frontier women had to be strong, resourceful, hard working, and a great horseman. Women in the 1800’s took part in all facets of Frontier Life. The hardship of frontier life required that all members of the family take part to make ends meet. So, 1800 women mounted their horses to hunt with their husbands and also camp out for days. Some women even became cattle-women. 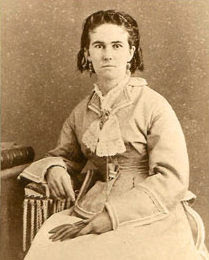 One such cattle-women was Elizabeth E. Johnson. *Elizabeth E. Johnson was born in Missouri in 1843. She moved to Hays County, Texas soon after her father had established the Johnson Institute there in 1852. 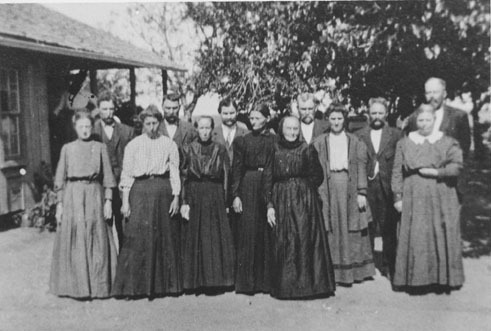 Lizzie began teaching at the school when she was sixteen. Later she left to teach in schools at Manor, Lockhart, and Austin. Quietly she saved her money and added to her income by writing stories for Frank Leslie’s Magazine. As she accumulated money, she invested it. At one point she purchased $2,500 worth of stock in the Evans, Snider, Bewell Cattle Co. of Chicago. She earned 100 percent dividends for three years straight and then sold her stock for $20,000. On June 1, 1871, she invested the money in cattle and registered her own brand (CY) in the Travis County brand book along with her mark. Lizzie Johnson’s wealth continued to grow. So did her responsibilities. In the summer of 1879, at the age of thirty-six, she married Hezkiah G Williams, a preacher and widower with several children. She continued to teach school in Austin, write magazine articles, and invest in cattle. She maintained control over her wealth, having had her husband sign a paper agreeing that all of her property remained hers. On his own, Hezkiah entered the cattle business in 1881, but he was a poor businessman who also liked to drink, and Lizzie had to keep pulling him out of financial trouble. At least twice Lizzie and Hezkiah traveled up the Chisholm Trail to Kansas. They rode behind the herd in a buggy drawn by a team of horses. This was about 1879, and Lizzie was the first woman to drive her own herd up the trail. For several years she and her husband, after coming up the trail, spent the fall and winter months in St. Louis, where Lizzie made extra money by keeping books for other cattlemen. When she died in 1924, at the age of 81 (her husband had died on 1914), Lizzie Johnson’s estate totaled more than $200,000, including large holdings in Austin real estate. The old west is filled with stories like this of men and women and their adventures on the trail. They worked hard for a living and expected their horse tack to work just as hard and to last. The styles of the old time horse tack are not only appealing to the “old time cowboy” but like the horse tack of the 1800, the durability and quality is essential to the cowboy and the horse. Breast Collar Old Martingale style "Choker"
Hand crafted from the finest Hermann Oak Rough Out Oiled Golden Bridle Leather with chap lining. 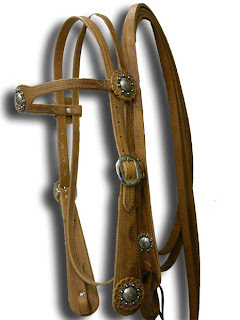 This Old Martingale style shaped breast collar (some in the sage call it a "CHOKER") features an over the shoulder fit for a better pulling position. Also featured is the adjustable neck strap and billet. This old time Traditional Buckaroo Cowboy Style Leather Headstall Set with Shaped Cheeks and Flair Brow is hand crafted from premium heavy weight Harness Hermann Oak Leather. Reins are the two leather rawhide or horsehair lines runnin’ from the bit ring to the riders hand used to guide and control the horse. There are 2 types of reins-but many styles –the flat leather, buckled onto the bit. The other’s braided rawhide with romal and is attached to the bit by “bit” chains or “bridle” chains. These are short pieces of chain fastened to the bit ring on one end and the reins on the other end. Some riders like chains because the reins don’t get wet when the horse drinks, also keeps the horse from chewin’ the reins. Open reins are then not tied together each independent of the other, usually ‘bout seven ft in length” most cowhands prefer open reins because if the horse falls or if the rider is throwed the reins fall to the ground. Tied closed or California reins are tied together at the ends or the entire reins are made in one piece often made of braided rawhide and worked into a romal at the horse end. Tied reins are not popular with most cowman, California is where the tied reins are used most, handed down by the early Spanish. The romal (pic tured here) is a flexible whip made on the bridle reins when they are fastened together. 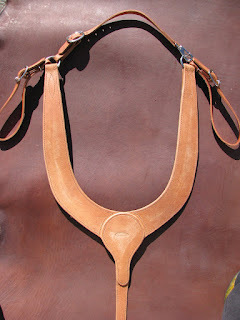 The Spanish "el romal" means literally "a branch road, a division or ramification thus attached" as it is by the loop to the bridle reins the romal becomes but a ramification of the rein, a handy addition that can be used as a quirt and dropped from the hand with out fear of it getting lost. The romals’ removed when ropin and placed ‘round the roper’s waist which was the reason most old timers ordered romals to their waist measure. A light romals no good if used as a quirt (pictured here) in windy weather for the lash’d be hittin’ the user in the face, a long romals no good either for it might cause the hoss to stumble and fall over it." Buckaroo Leather carries traditional old west style western leather reins. Buckaroo Leather Western Reins have uniform balance through out the complete length Because we take care to cut them side by side. They are PAIRED together, BORN together for that exact same feel & weight for the ultimate signal and communication! Most anyone can find Tack to meet their particular demands on the Buckaroo Leather website! Yet, for the rider who has needs for measurements, alterations or changes to bring their ideas to perfection, Buckaroo leather, has skilled craftsmen to meet their demands. Our Famous Best Selling Roping Reins, used for Roping or Rodeo Competitions. Quality Hermann Oak Lined and Oiled Harness Leather for that superior soft and supple "broke in" feel-the best on the planet! Available in your choice of 1/2" width or 5/8" width, 7 1/2 long. Finished with Loop Ties. Great for roping and trail riding. Click here to watch this proud video testimonial from a rein customer.